Small digs? No problem. A tiny space can still look amazing and function well. 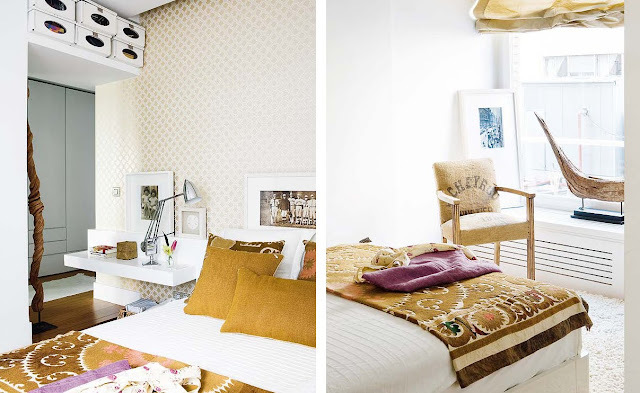 This adorable condo beautifully proves that point. Let’s look at what they did to visually enlarge their place…. 1. Limit your color palette. The use of cream, copper, brown, white and coral is repeated throughout. The punches of color add interest and tie all the rooms together. 2. Varied Texture. 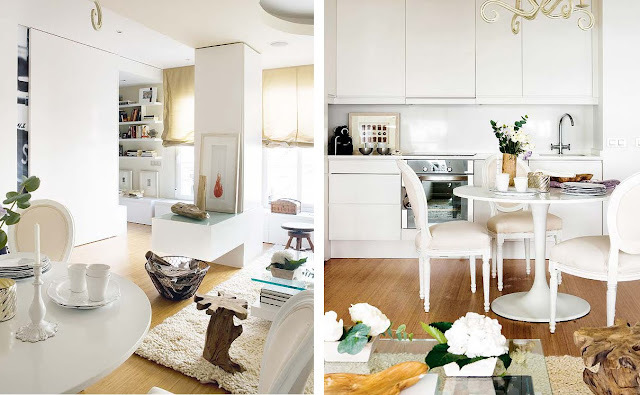 They’ve mixed old and new, shiny + rustic, modern + classical. It helps to warm up this home and prevents the “one stop shopping” look. 3. They’ve varied scale. One of the biggest mistakes I see when visiting a client’s home are issues with scale. More times then not homes are filled with a bunch of mid-sized things, they are usually the same scale, so the place just looks cluttered. Be sure to keep your eye bouncing around the room. Larger objects in a small space ALWAYS make the space feel bigger, just don’t forget to layer in smaller pieces! 4. Create points of interest, the entire space can’t scream for attention. I’m loving their unique finds; like the small wooden stool and gorgeous Suzani blanket. 5. Both vertical and horizontal planes have been considered here! All images via: Golden Cage blog.